Tamarindo beach is where everyone likes to stay when they vacation in Costa Rica. Today an incredible deal on a luxury villa near Tamarindo beach just opened up for December. You can live in luxury in a beach villa on the Pacific Ocean next to Tamarindo for an unheard of rate of only $44 per night, per person. Last minute cancelations are a real thorn in the side of villa rental owners, but they make for some incredible deals for a group that wants a last minute huge discount. As of this writing, days are open right now on this deal between the dates of December 6 – 26, 2017. That’s right! You can spend Christmas with your entire family on sunny Tamarindo beach this year! And it will be a ridiculously low $999 per night for your group of up to 23 people. This deal won’t last. So, if your dream vacation for your group is anywhere between the 6th and 26th of Dececember, 2017, call Casa de Luz to grab those dates now. Casa de Luz normally rents for nearly $2600 per night in December. This particular December had a large cancellation that drove their nightly rate down dramatically. 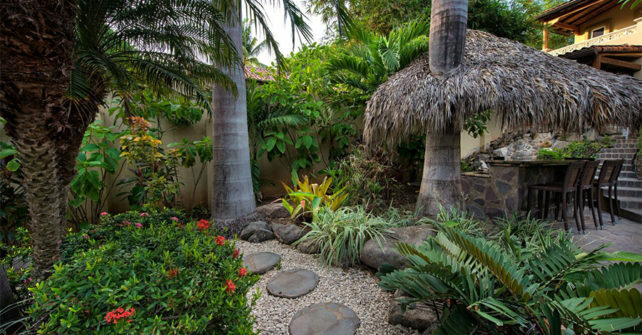 This luxury villa sits on the beach of the Pacific Ocean near Tamarindo in Langosta, Costa Rica. It is right next door to a nature preserve that helps the seaturtles nest and thrive. Casa de Luz has 8 bedrooms and can sleep up to 23 people. There is a day spa area near the private swimming pool that is perfect for booking salon personnel, massage therapists and other day spa professionals. Other professionals that can be booked are private chefs, musicians, bartenders and yoga instructors. Give us a call today to lock in your dates this month! The villa was spot on with lots room, good air con, great location,local to the shops, bars, restaurants and the beach.